Jerick Hamilton is a student farmer that finds the farm behind his school to be a quiet respite from the chaos of the city. He starts his afternoon with a careful plant inspection. Moving row to row, Hamilton bends down to pull away stray, dead leaves to ensure the livelihood of the crops. Hamilton loses track of time as he moves deeper into the sunflowers, or gets lower to the earth’s soil with the radishes and turnips. His eyes light up as he is asked to differentiate an array of brightly colored produce—produce that he helped grow. “Amazing. Jaw-dropping. Fun.” These are the words Jerick Hamilton, a junior at Woodlawn High School used to describe the school’s recent partnership with Jones Valley. Jones Valley Teaching Farm empowers students to grow, sell and eat their own produce. By inviting students at Woodlawn High School to participate in the farming process, Jones Valley is equipping change makers. Each weekday, Hamilton can be found carefully weeding one of the 10 beds of vegetables in Woodlawn High School’s Urban Farm. Among the sunflowers, turnips, radishes, mustard greens, chard, broccoli, cauliflower and kale, are the fingerprints of student farmers who stay behind after school and diligently tend to this plentiful garden. He is eager to share his new passion for gardening with others. For Hamilton, this opportunity has presented more than just a new hobby—it has given him vision for the future. Hamilton is one of the students at Woodlawn participating in an early college program established through Jones Valley. This partnership allows him to work for payment while also receiving school credit for his three-hour afternoon shift at the farm. Woodlawn High School Urban Farm sits just behind the school and is equipped with two farming acres, a greenhouse and an outdoor teaching area. This is where Scotty Feltman, the school’s environmental science teacher who doubles as the farm program director, brings his classes to expose students to healthy foods. Jones Valley originated as an urban farm in downtown Birmingham to provide better access to fresh produce. It has since evolved into a teaching farm through the implementation of a specialized curriculum model, Good School Food, in several Birmingham city schools. In that program, students experiment in Farm Labs designed to provide learning environments that engage the senses. With seven teaching farms across Birmingham, Jones Valley exposes students to nutrition as they interact with fresh food daily. This creates a greater awareness of where food comes from and emphasizes the value of healthy lifestyle choices. The leap to Woodlawn High School happened last year in an effort to create a K-12 learning experience where children participate in the growing process in different stages throughout their education. The program culminates in Feltman’s high school environmental science class, where the urban farm is used as a tool for engagement. Feltman was a fifth grade science teacher at Avondale Elementary when the idea for the urban farm began to formulate. He committed to the role of farm program director after realizing it would be a great opportunity to impact a lot of students. Feltman impresses upon his students the fact that they can help others through farming. His ultimate goal is that students leave the farm experience with a confidence in who they are and what they can accomplish. “I want students to be able to graduate knowing, ‘If I grew 200 pounds of radishes and I was able to feed my neighborhood, I can do a lot of stuff. Maybe college isn’t so scary,’” said Feltman. Senior Taylor Witt felt that empowerment. Witt uses her time on the farm to evaluate her lifestyle. “Maybe I can change my ways of eating and influence my friends and family members. I want to influence my nephews the most because they are young, the oldest is 7 and the youngest is 5,” she said. Witt got involved with Jones Valley after her ninth grade biology teacher encouraged her to attend an interest meeting. That meeting introduced the urban farm concept to the Woodlawn community. Witt worked with a group of students to brainstorm, provide input and contribute to the planning process as this idea materialized. The farm came to life last year, and it taught Witt a great deal about patience. “It’s a learning process. It’s building up your skills. I feel like each day I am out here is a day I am learning something new,” said Witt. Like Witt, the student farmers at Woodlawn have played an integral role in the process of building the garden from the ground up. Starting work in August, the team works in a student-driven manner where everyone’s voice is heard. Feltman, who oversees the co-op, is in a position to hear those distinct voices, as he develops personal relationship with the students involved. One of these voices belongs to Hamilton, who met Feltman as a student in his fifth grade class. His message to Feltman is one of profound gratitude, “Thank you, thank you for hiring me. Thank you for believing in me and showing me there is more to life,” said Hamilton. Clearly the art of farming transcends health to benefit students in areas of attitude, success in school, family life and relationships. Jones Valley uses fresh food as a powerful tool to apply disciplines of patience, responsibility and teamwork to real-life situations. 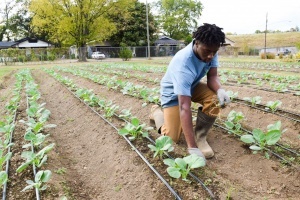 Through the process of farming at Woodlawn High School Urban Farm students find vision, purpose and an outlet for personal growth. The influence of the program extends far beyond growing plants, to the change taking root within the lives of students.